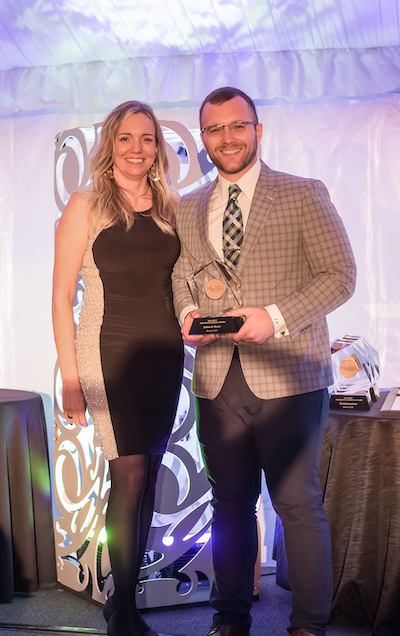 The Academy of Managed Care Pharmacy, or AMCP, awarded its 2019 New Practitioner Award to Josh Brown, Pharm.D., Ph.D., an assistant professor of pharmaceutical outcomes and policy. He received the award at the organization’s annual meeting in San Diego on March 26. AMCP established the award in 2015 to recognize an AMCP member making a significant contribution to managed care pharmacy within five years of graduation from first professional degree in pharmacy, medicine or nursing. Dr. Josh Brown receives the AMCP 2019 New Practitioner Award at the organization’s annual meeting in San Diego. Brown was nominated by colleague Robert Navarro, Pharm.D., who was a founding member of AMCP and the organization’s first president, and is an emeritus clinical faculty member of the UF College of Pharmacy. Navarro noted Brown’s prolific publication list and track record of research, experience with both managed care and pharmaceutical industries and his activities with UF’s local AMCP student chapter. “Dr. Navarro’s nomination truly means the world to me given his involvement with AMCP and the example he sets for excellence in this field,” Brown said. In his first five years since graduating with his Doctor of Pharmacy degree in 2014, Brown has published more than 50 manuscripts and his research has been funded by the NIH, FDA, PhRMA Foundation, and the Bill & Melinda Gates Foundation. He completed his Ph.D. at the University of Kentucky and participated in a joint Humana-Pfizer Fellowship program during which he led and conducted collaborative research between these organizations. Among other activities, he currently sits on the editorial advisory board of the Journal for Managed Care and Specialty Pharmacy, which is AMCP’s flagship publication the leading journal for managed care pharmacy.